Cuir d’Ange is the most recent addition to the Hermès Hermessence collection, a line of fragrances sold exclusively at the house’s boutiques. The idea is to capture the nuances of famous Hermès leather, which smells of flowers and musk. The perfumer behind it is Jean-Claude Ellena, a master of the most ethereal and delicate compositions, and as you would expect, Cuir d’Ange, Angel’s Leather, stays true to its name. It’s wispy and sheer, as if the leather that inspired it was polished to remove any traces of animal funk and made to smell like someone’s clean skin. Cuir d’Ange is pure comfort. Although I like to think of myself as someone unafraid of the raunchiest animalic scents, my favorite leathers in perfume bottles are soft and cuddly. I’m more in the camp of Bottega Veneta than that of Robert Piguet Bandit on most days. So, here you go. For this reason, the first time I smelled Cuir d’Ange, I felt that I discovered my ideal leather–creamy, suave, and mild. On the other hand, if you want the odor of a beaver in heat and don’t wish to settle for anything less, Cuir d’Ange will strike you as wimpy and bland. From the start, it makes me think of vintage cold creams and violet scented soaps, a whiff of my grandmother’s glamorous vanity table packed with porcelain jars and crystal bowls filled with powder. This tender, wholesome interlude is underpinned by the tangy, dry leather, which remains distinctive throughout, even if very mild. The dryness of leather is tempered by the milky almond notes and lots of musk. While Cuir d’Ange has plenty of subtle nuances, from a distance it feels like a blend of musk and leather, both well-scrubbed and with hints of soap bubbles. There is not a sharp edge in sight, and the perfume is a creamy, beige wrap that has the effortless elegance of something impeccably crafted. The only drawback I can find with Cuir d’Ange is its negligible lasting power, a common complaint with Hermessence perfumes. To get anything approaching the idea of a light cologne, I have to spray several times, making sure to add an extra spray on my clothes, and even then I’m not likely to kill anyone with my sillage. This is undeniably frustrating, and it makes this expensive perfume even more costly, since you’ll go through the bottle quickly. So, consider yourself warned and be sure to test Cuir d’Ange on skin before buying. All of this being said, I can’t help falling hard for Cuir d’Ange. The thing is that Cuir d’Ange doesn’t smell like a perfume but rather like a second skin. Your own skin but better. 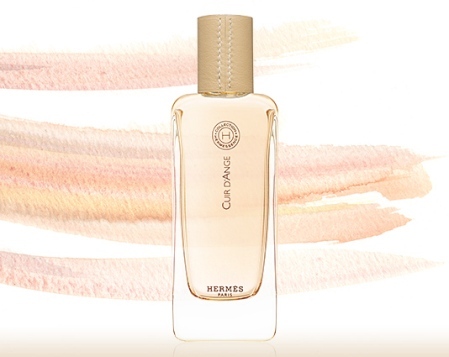 Hermès Cuir d’Ange includes notes of heliotrope, hawthorn, violet, narcissus and musk. It is number 12 in Hermès’s Hermessence collection. Available in Hermès boutiques. 100 ml Eau de Toilette/€185. If you have other recommendations for mild, soft leathers, please share them. I’m sure I’m not the only leather wimp in town. Cornelia Blimber: This is also certainly not a beaver in heat (Lol!). rainboweyes: I prefer soft leathers too! My favourites are Cuir de Nacré and Moulin Rouge but I’m looking for some more subtle leather scents to add to my autumn rotation. Victoria: It’s frustrating, since it’s so beautiful while it lasts. Aurora: It doesn’t get much love anywhere, so I hang my head in shame and admit: I adore Diorling. Yes to ‘creamy suave and mild’ leather, your review is so comprehensive it gives me the impression I have smelled Cuir d’Ange too. We can all do with more leather perfumes as there aren’t so many around these days. Michaela: Interesting but… low lasting power, six or seven sprays, and another one on clothes!… Not me, I think I tend to go for the beaver in heat. I’m not familiar with leather scents, but I do love Bottega Veneta. Well! I was Sure that I was the only perfume fanatic out there that could be classified a leather wimp! I Do like leather (or even better, suede) as an accent, but for the most part, very few leather-centric scents make it into my collection though I admire many. I love how you tie these reviews in with your memories. 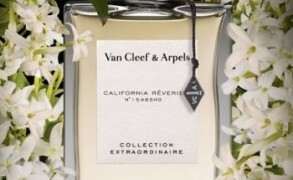 They make the fragrances even more personal and more desirable to try. Haven’t commented much lately – but I’ve been enjoying ALL of your recent posts! D.D. Jackson: I always seem to end up in the contrarian position. Clearly we “Beaver Heat” wearers are a later-sleeping group than those with less robust leanings. I hope this isn’t out of place but, I’d love a new themed sampling list. So, if I may, I’d like to raise the beaver-heat battle standard here for those readers who would be willing to nominate their “Best of Beaver Heat” recommenations for my sampling pleasure. Victoria: You’re not out of place at all! In fact, as Operafan mentioned, if you read blogs, you come away with an impression that pretty much everyone loves the strong, “take no prisoners” leathers. I admire them, but they’re not my first choice. D.D. Jackson: Thank you for your reply, Victoria. Trouble is I don’t know what I like. I’m late to the perfume rabbit hole and, after throwing quite a bit of time and money at the quest for ‘my scent’ last year, have mostly put that search away. Victoria: I always recommend to start the search slowly and to really take time testing the same perfume over and over again. Now, I know from my personal experience that it is the hardest part, because it’s tempting to get a whole bunch of samples and go through them quickly. And also, I know from a personal experience that this is an expensive and sometimes fruitless way of searching, because only by getting to know a few perfumes really well do you figure out your tastes. You may never end up loving Dzing, but you may discover that you love a certain part of it, and you can then recognize easily in another perfume. D.D. Jackson: Thank you once again. I understand your points entirely and, in fact, that is largely what I was told by Robin and her friends at NST. —And that’s why I said I had put the search aside. I had wanted something short and simple. Now I think of myself as more of a scent tourist. At my age I am shedding projects rather than engaging in new ones. Were I twenty or forty years younger, the slower gradual buildup of real knowledge you recommend would make perfect sense. -Cuir Ottoman ( I have to admit that Cuir Ottoman is completely soft and well behaved on me.. I don’t get any Ottoman-associations from it). Cath: I love my leathers in all genres: from hard(er) Leather Oud to subtle Cuir Cannage en passant par many others like for example like Cuir Ottoman, Bottega Veneta and Tuscan Leather. allgirlmafia: Thanks to you, V, I have found great pleasure in my small bottle of vintage Jolie Madame. Cabochard is another that makes me inhale deeply each time we meet. When I read the announcement that Hermes is going to introduce Cuir d’Ange I was very interested in trying this perfume, despite the fact that almost every single Hermes fragrance I tried didn’t work for me. Cuir d’Ange sounds like a really nice perfume, although I’m noticing that I’m starting to prefer when my leather perfumes have a little bit more presence and intensity. That really is an issue that the perfume is so light you have to apply with abandon to smell it on yourself. annemarie: I get that there is beauty in ethereality, but in practical terms, I am on a tight budget and perfume has to work hard and do its bit. I get all day longevity out of two or three sprays of Bottega Veneta, and BV is much cheaper and more widely available. So there is really no contest. That said, out of curiosity I will probably get hold of a sample or decant of Cuir d’Ange, just out of curiosity. Julie: I do love leather in my perfume, Cuir de Lancôme and Bottega Veneta are two favorites. I appreciate JCE’s mastery in creating a beautiful scent but what’s the point if you can’t even enjoy it because it doesn’t last? Austenfan: I still need to try most of the Hermessences! I like a lot of Ellena’s work but really fleeting perfumes won’t make it on my to buy list. Victoria: I love Boxeuses and I have been wearing it a lot lately. It’s a bolder leather than Bottega Veneta, but it’s not aggressive or rough. Emma: Finally I understand Ellena’s highly unobtrusive olfactory style for Hermès. He explains on an interview by Sarah from flairflair.com the house of Hermès is «une maison de l’après-midi» , an afternoon house and definitely not a house of the night unlike other brands, and that was what he had in mind at all times when he created Jour d’Hermès. The Hermessence collection is obviously created after the same afternoon spirit. Ellena also admits he was surprised yet flatteted when he found out there were women sleeping wearing Jour as he never imagined his fragrances to be worn at night, which I think is very revealing of where he’s coming from on the creative and conceptual level. Emma: I’m with you on this. I can no longer wear monster sillage such as Boucheron and Alien. I’m wearing Jour right now two years after dismissing it originally, I do enjoy it a lot but I need to reapply during the day which is fine because the refill is not expensive but as you mentioned reapplying Hermessence isn’t really cheap. Victoria: Alien is a beautiful perfume, but its strong sillage makes it almost impossible for me to wear. It’s a perfume that wears me, not the other way around. Emma: I went to the Hermès boutique in Manhasset yesterday and they didn’t have it and had no idea when it’s coming. Emma: I thought you lived in a very affluent community of Bergen County, I don’t know why. Merlin: Coming to this post rather late, but I have just recently realized how leather-heavy my collection is!